If you’re taking your cakes to a picnic or bake sale, how do you get them there safely? Here are four ways to transport them that will fit every budget. Set the cleaned cupcake pan in a roasting pan (disposable or otherwise) that’s deep enough to completely enclose the tops of the frosted cakes. 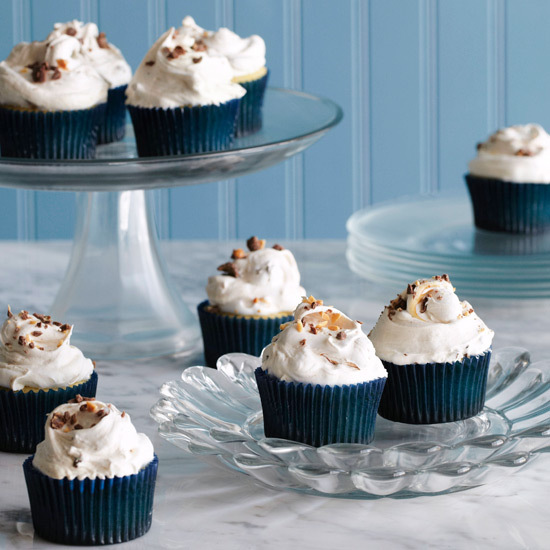 After your cupcakes have cooled, return them to cups in the tin and frost them. Cover the pan with foil, and you’re ready to go. If your cakes are minimally frosted, arrange them in a large, shallow plastic container so they are just touching. Be sure to keep the container horizontal as you travel. To prevent extensively decorated cupcakes from moving around, layer non-skid shelving liner (or even a silpat mat) in your resealable container or shallow boxes (such as sheet cake boxes) that are deep enough to hold the frosted cakes. Arrange the cupcakes so they’re close but not touching; the liner will keep them in place. If you’re a cupcake devotee and have some space in the house, it might be worth investing in a cupcake carrier. Many of them are stackable, allowing you to customize them based on how many cupcakes you need to transport. Kristin Donnelly is a former Food & Wine editor and author of The Modern Potluck . She is also the cofounder of Stewart & Claire, an all-natural line of lip balms made in Brooklyn.